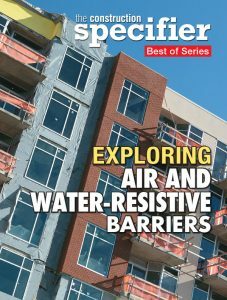 The Construction Specifier’s series of sponsored e-books continues with an examination of the building envelope components. Exploring Air and Water-resistive Barriers is a four-part e-book that takes an in-depth look at managing air movement and moisture in buildings. The newest volume in this series of free, downloadable e-books discusses topics ranging from building wraps, tapes, and flashings, to the impact of recent code changes as they relate to air and moisture management. Investigate why airtight standards for energy efficiency have created new challenges for moisture management, and the potential implications of various compliance approaches. Learn how controlling air, vapor, and thermal transfer helps mitigate moisture problems within the building envelope. The e-book also covers trends found during the testing of tapes and flashings, particularly as they relate to adherence, durability, and the products’ abilities to accommodate movement.